Talk about a floral fantasy. 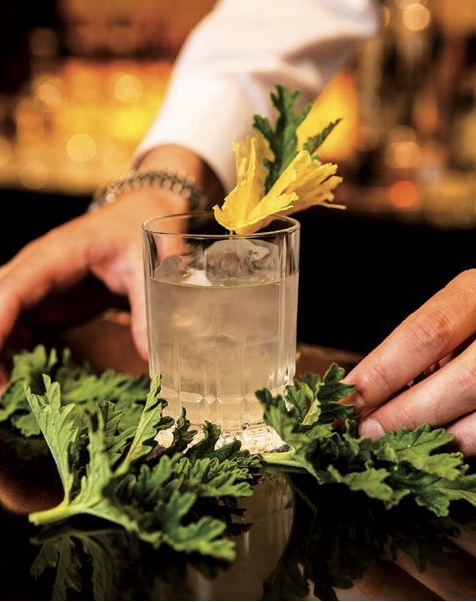 This spring, cocktails made with fresh blossoms are spreading like wildflowers. 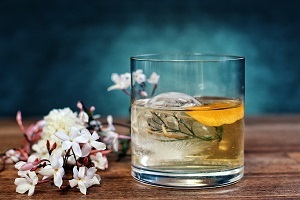 Whether plucking from their own backyards, from rooftop gardens, or just neighborly sharing of their fortuitous abundance, bartenders are serving up a bounty of blossoms to cocktail enthusiasts. 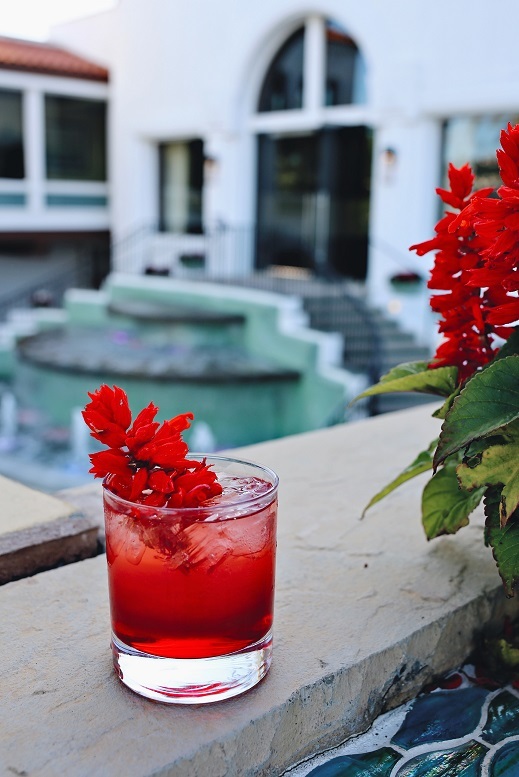 From restaurant bars to cocktail bars to hotel lobby and pool bars floral garnishes of jasmine flowers and hibiscus have been spotted on the west coast, while across the pond in London capucine capers take center stage and in the south of France a bounty of bougainvillea premiers in a punch. All proving that no matter where you wield your tins and mixing glass the garden is merely an arm’s reach away. 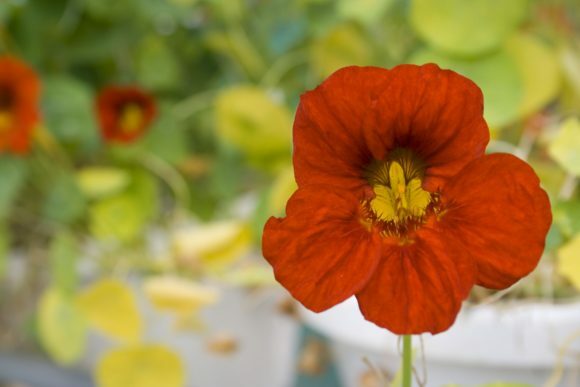 Join us as we take a gander to see what’s sprouting up at home and abroad. Build all ingredients in a rocks glass, including jasmine ice globe. Before stirring the drink, take a paring knife to the part of the orange rind that was just peeled. Make a deeper cut into the citrus, peeling off a section with pulp. Squeeze that part over the drink, adding a touch of fresh juice. Stir with a bar spoon 10-15 times and serve. Add Chinese jasmine pearls plus several sprigs of wild jasmine to the bottle of vodka. Strain after six hours. If the infusion is more bitter than floral, dilute with the reserved vodka until a balanced flavor is achieved. Use a silicone mold and distilled water that has been boiled for several minutes and allowed to cool. Add the flowers to the molds and fill only half full with water. Once frozen, fill to the top and return to the freezer until solid. In a shaker, pour the vodka, St.-Germain, hibiscus syrup, rosewater and lemon juice. Fill with ice and shake vigorously. Fill Collins glass with ice. Strain the shaker into the glass and top with club soda. Stir and garnish with a hibiscus flower. In a mixing glass filled with ice, combine gin, vermouth infusion, Cocchi Americano and orange bitters. Stir until sufficiently chilled. Strain into a chilled Nick & Nora glass. Float one capucine flower atop cocktail or garnish with a caper. Rinse flowers and dry thoroughly. In a glass container, combine flowers and vermouth. Store covered in refrigerator for three days, then filter into jar. Pour rum and pineapple water into a mixing glass filled with ice. Stir. Serve in an Old Fashioned glass filled with ice. Garnish with dried pineapple and rose geranium leaf. Cut a whole pineapple into cubes. Place into a 2-liter pot and cover with 2½ cups of cold mineral water. Add 1 teaspoon of fleur de sel. Cover and simmer on low for 30 minutes. 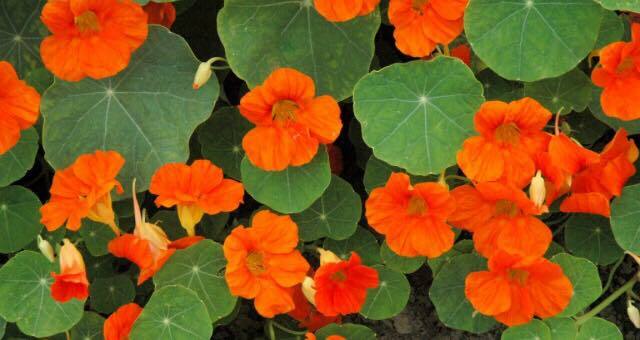 Remove from heat and add 25 green leaves of rose geranium. Stir. Cover and let sit for 24 hours. Filter into jars. Yields approximately 5 cups. Subscribe to INSIDE F&B RSS!